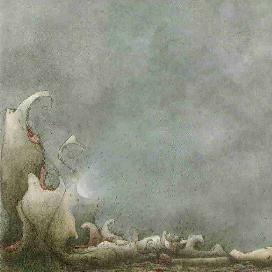 Eluvium - "An Accidental Memory In The Case Of Death"
Eluvium is a solo piano CD by pianist, Mathew Cooper. Who would have thought a hard rocker like me would be playing this CD a lot? Somehow it just finds its way back into the CD player. After listening to a lot of heavy stuff, I have really enjoyed this CD a lot. Solo piano music is a major challenge as is a whole CD of any single instrument. How do you generate enough variety to keep it interesting and not sound all the same. Or does it matter as long as it evokes emotion in the listener? I really liked the artwork as well. For more information you can visit the Temporary Residence web site at: http://www.temporaryresidence.com. Contact via snail mail c/o Temporary Residence; PO Box 11390; Portland, OR 97211.